Made of durable, long-lasting flat steel bars that act as a graffiti deterrent, and reinforced with circular metal bands. Lid comes off easily for quick trash liner removal. Available in your choice of lid styles: flat top, rain cap, ash urn or dome top. Anchor kit includes hardware for surface mounting. 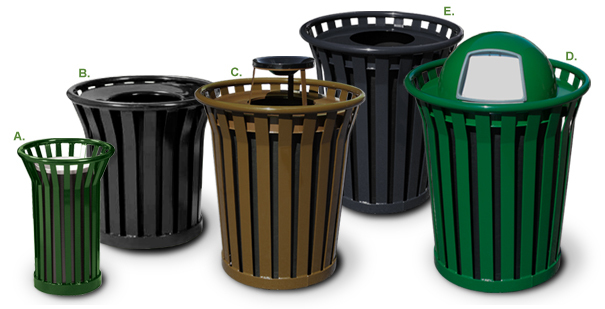 Choose from the powder-coated color options shown. 24 & 36 Gallon Sizes. Black Plastic Liner and Lid Included.